A day that began with the school prayer meeting at St James's School ended at the Empress of India in the parish of Morden where I was down to give a talk at the men's curry night on 'What's good about Good Friday?' as part of the mission, Passion for Life. This was something of a return fixture, as Morden Team Vicar, Les Wells, came to Bermondsey last month to speak at our men's breakfast. At that event Les told how he delivered his fifth child on the living room floor. 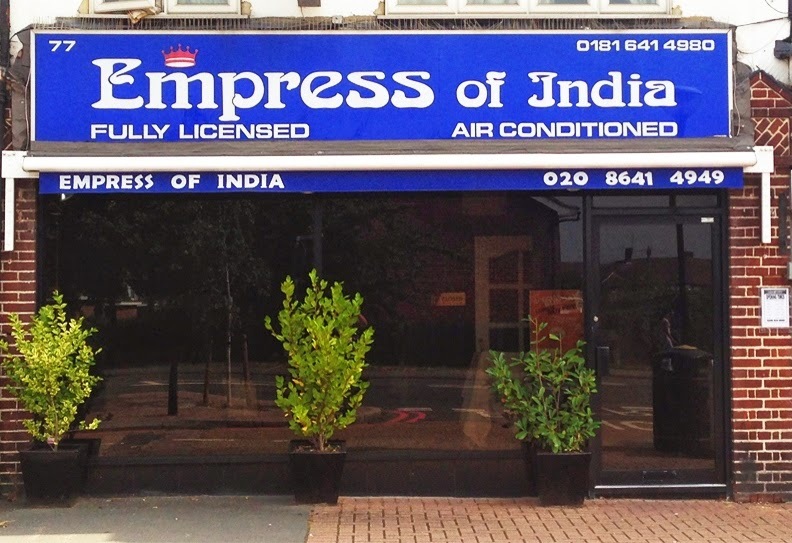 I was pleased to see that 'baby', now a strapping 20 year old, along with quite a few of his mates, among the 40 or so men who just about took up every seat at the Empress of India. As a new boy in Bermondsey there is one name I have heard over and over again: Snowy Davoll. 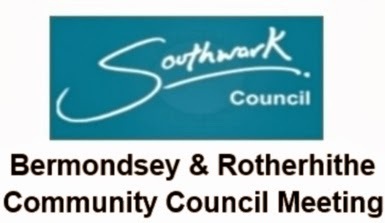 There were many tears on Sunday as our two congregations learnt of the death of a local hero, a Bermondsey legend, and a dedicated servant of the Lord. Today we have published on the church website an appreciation of Snowy's life by Adrian Greenwood. You can read it here. On Saturday 5th April at 12 noon there will be a memorial service for Snowy in St James's Church, followed by refreshments at St James's School, as we meet to remember and give thanks for a life well lived. This morning we were thinking of Jesus's encounter with the Samaritan women at the well, as related in chapter 4 of John's Gospel. 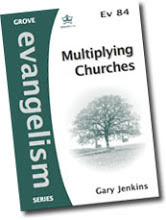 Introducing people to love - the love of God who so loved the world - is what the church is for. Its what Jesus was doing around that Samaritan well. They've done it brilliantly in Tulse Hill and become a Facebook sensation in the process, and its what we are trying to do here in Bermondsey, too. Twenty four men sat down for a full English at St James's this morning to hear the Reverend Peter Allen, aka the Boxing Vicar, talk about his work as a sports chaplain in Sheffield at our latest men's breakfast. Some people come to faith slowly. Some people have a dramatic overnight conversions, like Paul on the road to Damascus, or like Pete, a twenty-year old scalliwag working in a Sheffield greengrocer's who had a life changing encounter with Jesus Christ. Since then he's had a passion to share the Gospel with others. That led to training with the Church Army, ordination in the CofE, and his work amongst the sporting community in Sheffield, including professional football and, as we heard today: boxing. It wasn't quite the end of the world but it was the end of our Big Picture course tonight and the theme was the end of the world - or, more properly, the Day of the Lord, the return of Christ, the end of this world and the beginning of the new improved version of the creation that God will usher in on that day. Christians believe in getting stuck into this world, and that's why it was good that while the Big Picturers were meeting in the south lounge, we were playing host in the main body of the church to the Bermondsey and Rotherhithe Community Council, bringing together councillors, local people, churches and societies and agencies with a concern for the local area. But whilst we believe in fully getting stuck into this world, we also look forward to the completion of God's big plan and the eventual re-creation of all things. That's why we are people of hope. The day had begun, however, with an educational theme. First up were two assemblies for St James's School, and this being world water week (the whole school is thinking about water), our focus was on Jesus words about life-giving water to the woman at the well in John 4.
the Christian distinctiveness of the school. Today we were looking at the policy for Religious Education, a legal requirement for any school, and a vital component of the curriculum for a church school. The children are getting ready for a special focus on Easter in the last week of term, culminating with Bishop Michael's visit to our end of term service in church on April 4th and his first visit to St James's School. 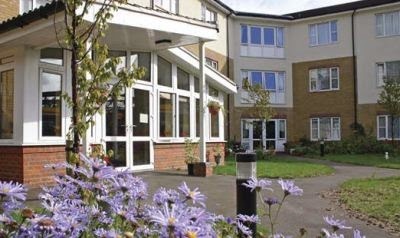 To Bluegrove Care Home in Southwark Park Road for our monthly service. A good number of residents joined us to sing their favourite hymns (they chose All Things Bright & Beautiful; Amazing Grace; Praise to the Lord Almighty, and I chose What a friend we have in Jesus to fit in with the theme of the talk, which was based on Jesus calming the storm from Mark 4). Bluegrove is a wonderfully bright and cheery home, with a friendly welcoming staff to match, who always join in with our services, and it is good to have this link with them (also with nearby Rock Grove). 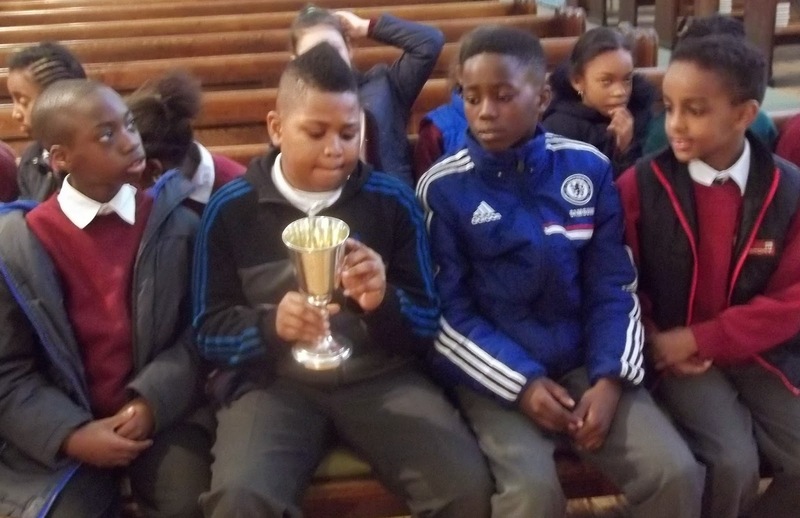 Later it was back to St James's Church for a visit from a year 5 class at St James's School. We climbed up to the very top of the church to see the Pauper's Galleries (now hidden from view), where the poorest of the poor would perch to view the services from their location just below the ceiling. We descended to the depths of the crypt to see where Bermondsey families sheltered during the Blitz. We went to the font - where one of the teaching assistants has been baptised as a baby - to learn about baptism and do a mock baptism (Any volunteers, I asked? Thirty hands went up). 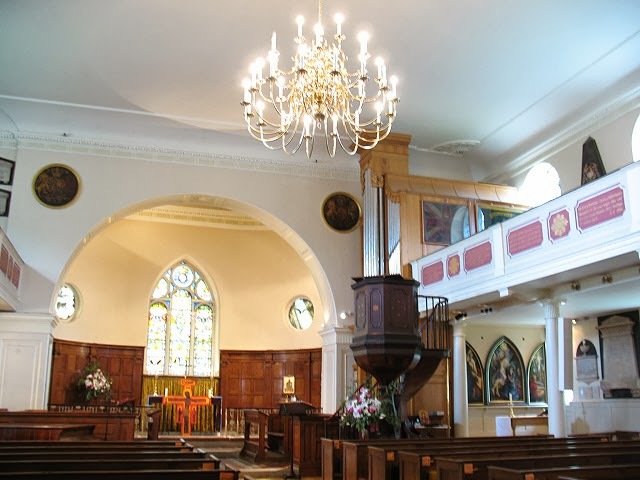 Several of the children had themselves been baptised at St James's and at least one of them said their parents had been married there. 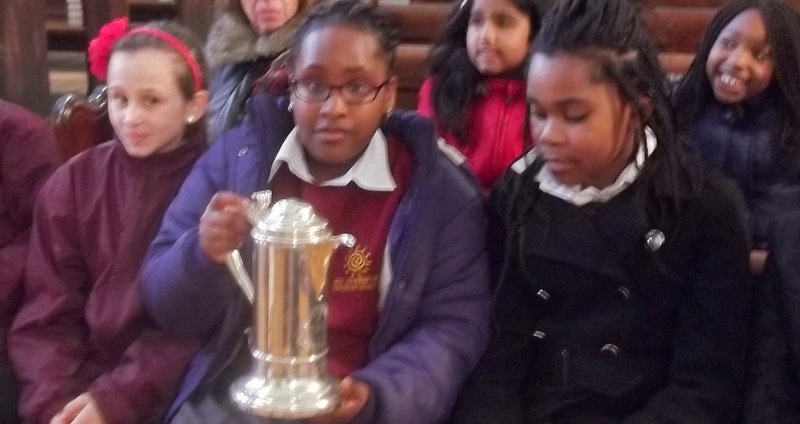 And we learnt about the Holy Communion and the children had the chance to handle the silver Chalice (above), Paten, and Flagon (below), given to the church when it was built in 1829, and used every week since as we have eaten the bread, drunk the wine, and done 'this in remembrance' of him. Today we had the last but one of our Big Picture evenings as part of our Bermondsey Christian Training Programme. Thinking tonight, in our overview of the whole book, of the gift of the Spirit, and the life of the church, we concluded with this Powerpoint slide (left). That is our high calling. That's who we are in God's great plan. 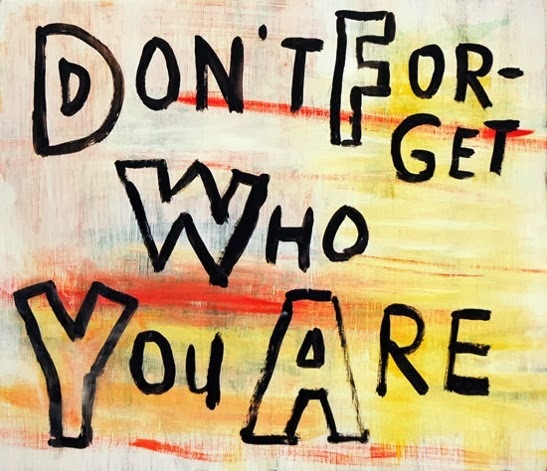 We mustn't forget who we are. Next week, our last in the course, is the end of the world, or rather, how everything ends up in God's big plan. "This seems to be a cheerful world, Donatus, when I view it from this fair garden under the shadow of these vines. But if I climb some great mountain and look out over the wide lands, you know very well what I would see -- brigands on the road, pirates on the seas, in the amphitheatres men murdering each other to please the applauding crowds, and under all roofs I see misery and selfishness. It is really a bad world, Donatus, an incredibly bad world. Yet in the midst of it, I have found a quiet and holy people. They have discovered a joy which is a thousand times better than any pleasure of this sinful life. They are despised and persecuted but they care not, These people, Donatus, are Christians and I am one of them." 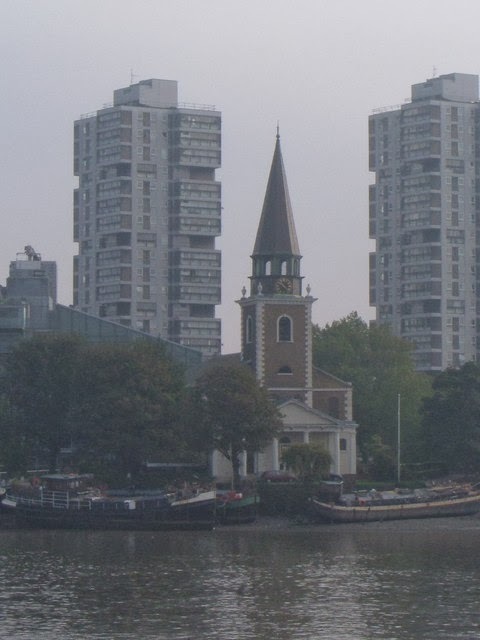 To St Mary's, Battersea, on the banks of the Thames, this evening for their Lent Course where I had been asked to speak on the contribution of the evangelical tradition to Anglican faith and spirituality. As a Battersea boy this was a deeply nostalgic experience. Here in 1954 my parents were married, and in the mid-sixties we lived overlooking the church on the nineteenth floor of the newly-built Selworthy House (to the left of St Mary's in the photo). Just round the corner I was a pupil at Sir Walter St John's Grammar School, endowed in 1700 for 'twenty poor boys of the parish' by the Lord of the Manor, after whom our school was named, and whose family motto, Rather Deathe than False of Faythe, was our motto, and the subject of our school song. By the 1970s there was more than 500 of us and we could all just about squeeze into St Mary's, filling its Georgian galleries, for our Christmas carol service each year. 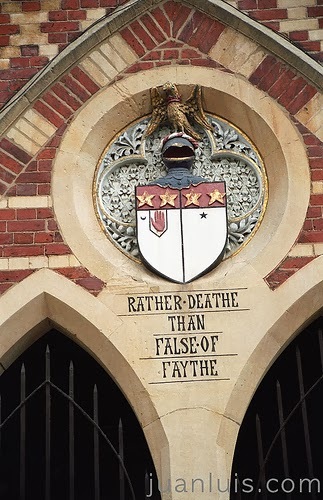 As for the evangelical tradition, I didn't know much about that as a youngster, nor did our family ever visit St Mary's (except very occasionally for weddings and funerals) but it was at Sir Walter St John's School - or 'Sinjuns', as everyone in Battersea knew it - that as a sixth former I came to faith in Christ through the witness of a teacher. There were many things I learnt at that school, not least a love of learning itself, but, best of all, I learnt Christ, and it was good to be back in Battersea to speak about the tradition of faith that means so much to me, that loves to speak of Christ, that honours the Scriptures as his inspired word, and takes delight in his saving death and resurrection. 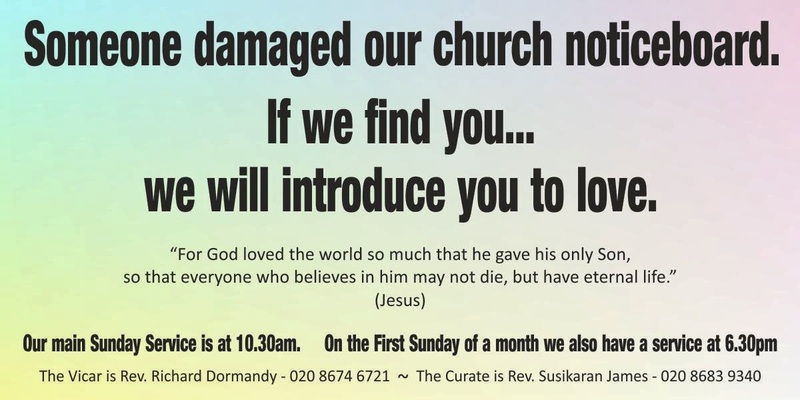 Today is Ash Wednesday, the beginning of Lent, and as well as joining in with the united Ash Wednesday service at St Mary's, Bermondsey, this lunchtime at 12.30pm, we are beginning our special Lent focus on mission in the united benefice of St James and St Anne's. The idea is that every member of the church stops at 10 o'clock to pray every day during Lent. Ten in the morning or ten at night? It could be either. On Sunday everyone in both churches received a copy of the 'Prayer at Ten' prayer card (left). 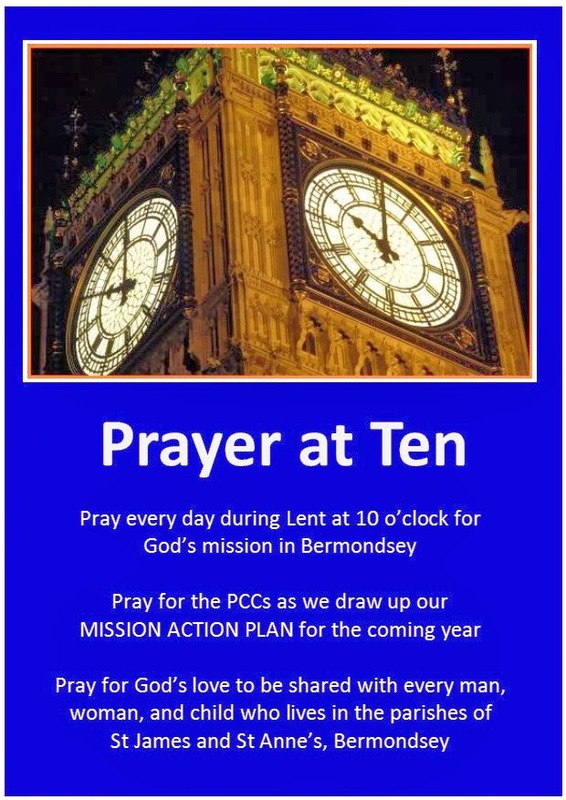 With our two church councils poised to draw up a MISSION ACTION PLAN, it seemed a good idea to pray for God's mission here in Bermondsey. Let's pray for the Spirit's inspiration for the church councils in their deliberations and let's pray for our great goal: that God's love can be shared with every man, woman and child in the parishes of St James and St Anne's. 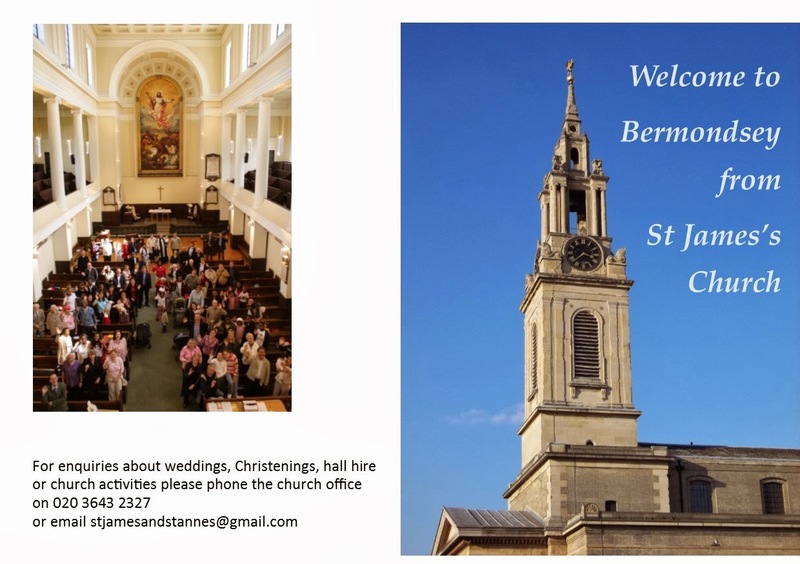 The newest residents of our parish - in the latest part of the Bermondsey Spa development to open (left) - have now all received our new 'Welcome to Bermondsey' card (below). 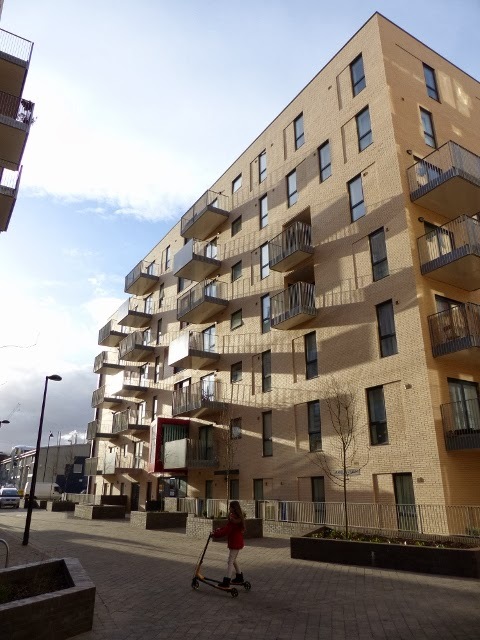 We have plenty of cards left for the remaining parts of the Bermondsey Spa development in the parish which are still being built and for the flats which are at present under construction at Chambers Wharf. In the meantime, we are handing out the cards to visitors to open church at St James on Mondays and Thursdays. Inside the card are some words of welcome from me and some details of church events and activities.